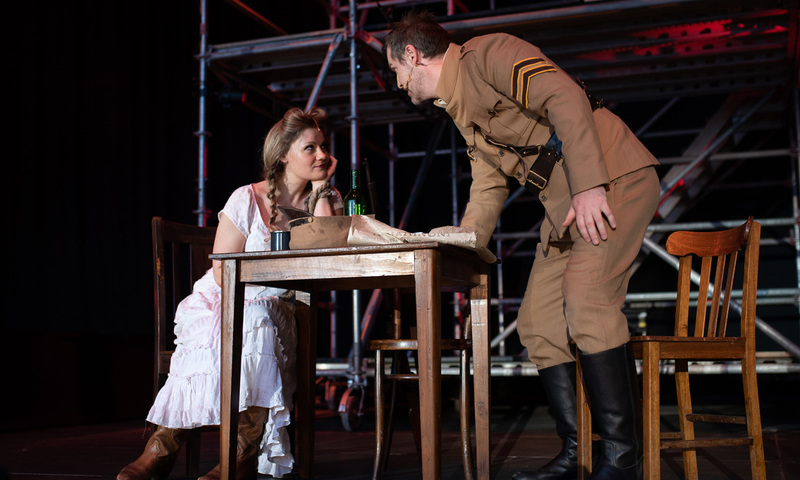 State Opera SA’s bold move to stage the blockbuster Carmen in Victoria Square on Saturday night proves there’s a mass audience for locally-produced opera in Adelaide. Artistically and organisationally, this was always going to be an enormous challenge – and there were a few hitches in both regards. 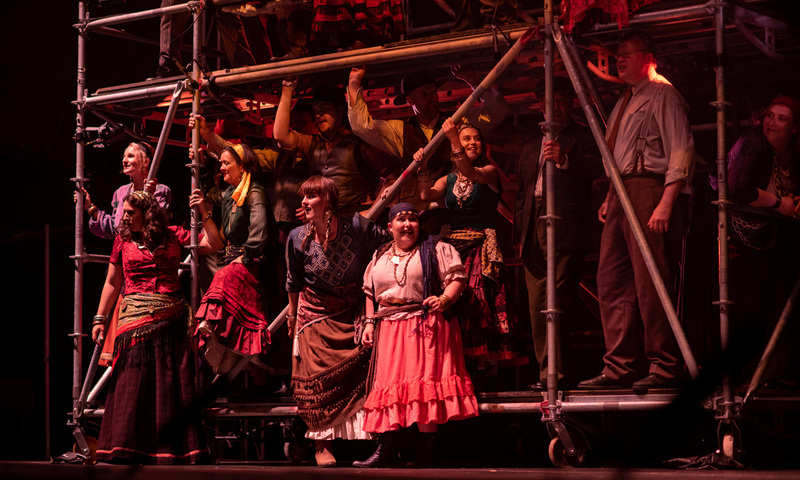 With its long list of well-loved tunes, Bizet’s Carmen was a wise choice for this experiment, which attracted a sold-out audience – seated in the northern part of the Square, and in a “picnic” setting on the southern side. Some attendees expressed surprise that the general admission area did not have a view of the main stage; instead, they watched the action on a large screen. The still night meant the sound quality in the seated area was fine, if not as rich as a traditional interior production. The Adelaide Symphony Orchestra, under the baton of Oliver von Dohnányi, was as sparkling as always and the top-line cast was good, with a few scaling into great. Some of the design choices, however, provide lessons for any future grand-scale outdoor performances. The set was minimalist – essentially a plain industrial scaffold – and the costumes were also subdued, although the big screens either side of the stage enabled the audience to see they were finely detailed. Given the promise of a sultry Spanish night, some pops of vivid colour would have been welcome, given this was essentially a traditional staging of the world’s most famous opera. Mezzo-soprano Helen Sherman played the central character with grit and controlled ferocity, her muscular voice suited to this sort of portrayal. There was less fire and more ice in this portrayal, which added an unexpected ambiguity, at times, to her interplay with tenor James Egglestone’s Don José. More than the show-stopping tunes, Sherman hit the heights in her heartbreakingly performed scene in Act 3 when Carmen foresees her own death, and that of Don José, in the cards. The standout performance was soprano Emma Pearson’s portrayal of Micaëla, the character who tries, unsuccessfully, to steer Don José away from self-destruction and towards duty. Her Act 3 aria, pleading with Don José to return to his mother, was a masterclass in control and dynamics. Stunning. Egglestone produced a tender version of the “flower” aria, and baritone Morgan Pearse handled the famous “Toreador” song with elan. The State Opera chorus clearly enjoyed its work. Director Stuart Maunder’s vision had an eye to the technology at play: the large screens allowed an “intimate” view of the performers and there were no distractions in the lighting or sets to take away from this. But in the wide open spaces, with trams rolling by and lights winking on nearby building site cranes, some more theatrical fireworks would have been welcomed by this reviewer. There were a few organisational issues that should be ironed out, if the State Opera does this sort of alfresco production again (and I certainly hope it does). The bar facilities were hammered before the show, with long queues snaking down the steps and causing frustration for many patrons. Likewise, there was the perennial problem of too few toilet facilities for women – many were still in line when the second half resumed after interval.